A minicab driver suffered a suspected heart attack moments after his car windows were smashed in by armed men. 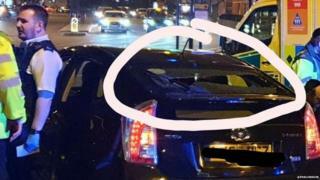 The taxi, which was carrying three passengers, was boxed in by another car on Amhurst Park in Stamford Hill, north London, on Saturday night. Four or five men got out of the other car and attacked the taxi. The victim, a man in his 40s, was found slumped in the driver's seat by police. He was taken to hospital where he remains in a critical condition. Police believe the victim's car, a Toyota Prius, was followed by a white Ford Focus prior to the attack at about 23:30 GMT. The Ford boxed in the minicab near the junction with Rav Pinter Close where the attack, which detectives believe was planned, took place. Detective Constable James Readman said: "Although the driver was not injured directly by the suspects, it is believed he was taken ill shortly after the attack on the car. "He now remains in hospital in a life-threatening condition and my officers are working to identify the group of males responsible."